If you are on Lookbook, you may of spotted this look on my profile. I thought I would share it with you as I love it! The shirt is by H&M and cost £14.99. I bought it in a size 16 so I could wear it as more of a dress with a waist belt. The one in the picture is from Primark and was only £1.00! I teamed these with my trusty grandpa cardigan and some black leggings, and wore my grey heeled military boots to keep my feet toasty and warm. You may also of spied my beautiful Toy Watch! Now, if any of you follow me on Twitter, or have been clever enough to spy my latest news on the feed in the sidebar, you will see that I am going to see a Westie puppy tomorrow. You probably already noticed that I absolutely adore them and have wanted one for a long time, so you can imagine my reaction when I saw one for sale 12 miles from me in an ad. He is 13 weeks old and is called Toby, and if everything runs smoothly, and he likes me, I will of just brought him home this time next week! I’m so excited! I’ll let you know how it all goes tomorrow! Thats all from me tonight! Make sure you enter the giveaway a few posts down for a chance to win some lovely goodies! Buying clothes in sizes that are lots bigger is such a good idea! Love the outfit, I've had my eye on that shirt for a while! I love the outfit! 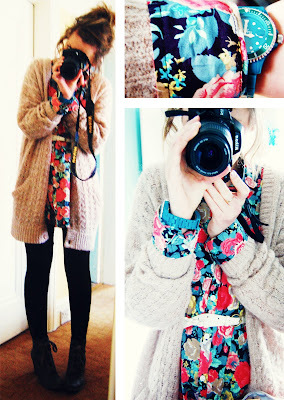 i love the cardigan especially, I would love to own it. I love the blog too. I actually love this outfit, I've done the same with a too big shirt before but didn't pull it off that well, I looked like some sort of frumpy nurse. found your blog on ifb! ooo your blog is just lovely! love your dress (i'm a huge fan of florals). can't wait to see your future outfits. lucky you getting a westie! they're SO CUTE! ahhhh. ooooh love this – especially the cardigan! where's it from? i need one!